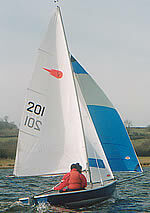 Sailed with just the mainsail, the Versa is a very steady and extremely comfortable singlehander. Unfurl the jib and she becomes a great family dinghy with secure "sit in" seats, ideal for children. The ability to have oars, outboard motors and stowage lockers make the Versa great fun for family holidays. For more excitement, the addition of the asymmetric spinnaker on a swivelling pole turns the Versa into a modern style racer that is exciting without the demands of the more extreme dinghies. jib, but if you want to race with a spinnaker, you must carry a crew.